Looking for a great small coffee machine? You should never compromise on the necessities, even if your kitchen is ridiculously small and tight on space. In our modest opinion, coffee is a necessity and therefore a great coffee machine is something you really shouldn’t do without. When it comes to choosing a small coffee machine, the choice is varied. So, we’ve put together list of the best to help you discover the right one for your small kitchen based on its design and functions. Find our pick of the very best coffee machines of all types. A new coffee machine means a new coffee table, right? The best small coffee machine for you will definitely depend on how you like to take your coffee. We’ve put the Smeg ECF01 Coffee Machine at the top of our list because it offers the perfect blend of style and functionality. Choose between four smart colours. Pod or ground, it’s up to you – and you can even froth your own milk. But that doesn’t mean you can’t go for something like the De'Longhi Distinta Filter Coffee Maker if you love an Americano, or the Wacaco Minipresso NS if you decide that you can’t justify the space after all. Find out more about designing a small kitchen in our guide. Its beautiful, bold exterior brings the phrase ‘nobody puts baby in the corner’ to mind – it may be small but it certainly takes centre stage with its theatrical functioning and flamboyant design. 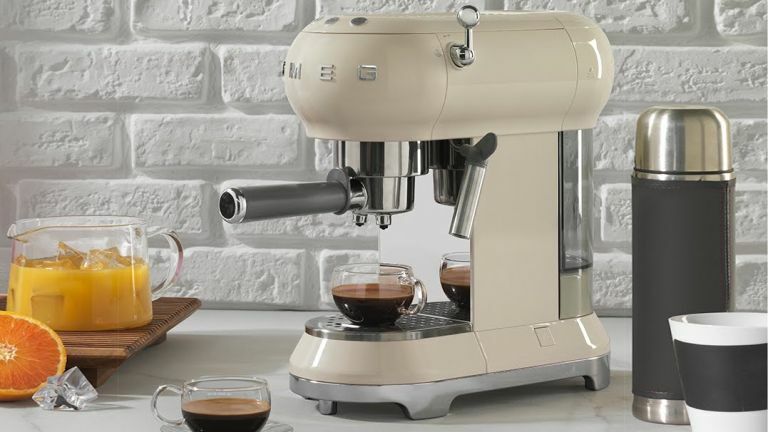 Whether it’s warming your coffee cup to just the right temperature, using 15mm bar pressure to form the perfect espresso or frothing your milk until it’s light and indulgent, this retro styled machine is a kitchen must-have and certainly a buy you won’t regret. While Smeg arguably does retro with relative simplicity, you can usually rely on KitchenAid to showcase a few bells and whistles. Whether it’s the six coffee programmes, automatic turn off or 30 second heat up time, this beautifully stylish small coffee machine will certainly ensure you never regret making the extra space for it. To make things even easier for you, the machine features a descaling option so you can keep it in great condition for many years of reliable service. This small coffee machine from De’Longhi rivals the KitchenAid in gadgetry, thanks to a quick heat up, adjustable steam frother and interchangeable devices for producing the perfect crema. It works perfectly well with both ground coffee and pods, so if your palate is particularly fussy, you can explore all the options to find the perfect blend. While traditional in shape, its matted stainless steel and chrome outer brings it steadfast into the 21st century and at half the price of the other two, it’s certainly worth consideration. When your friends are round for coffee and cake, it can take an age to set up the espresso machine for each person. This filter coffee machine enables you to make up to 10 large cups of filter coffee in one go, which is perfect if it’s americanos or flat whites all round. You can use a ground blend of your choice – none of that ‘nasty stuff’ that you may have become accustomed to in greasy spoon cafes – while its beautiful matte stainless steel exterior will make a good impression on your countertop, too. Petite, and so convenient for commuters! If you worry that you don’t have a minute spare to make yourself a coffee in the morning, you should take a look at the Brew & Go from Russell Hobbs. It’ll only set you back £30 or so and you can put it on a timer so your coffee is hot, fresh and ready for you just as you walk out the door, which means it saves you both time and money. If you want a fresh coffee when you’re relaxing at home, just pop your favourite mug on the drip tray instead. With its gunmetal grey exterior, the Lavazza immediately looks like it means business. Compatible with coffee pods, this stylish, high pressured machine produces both single and double espressos with a smooth, rich crema. Use compatible milk pods alongside its range of preset coffee settings to create your own drink, whether it’s a cappuccino or a latte. While it does only have a 0.6ltr capacity tank, it’s perfect for individual usage. If you are particularly fussy about your coffee but you’re struggling to find a large enough space in your kitchen for a full-sized coffee machine, this clever little portable espresso maker can be tucked neatly in a drawer until you’re ready to use it. Simply fill the base up with hot water, use the scoop to pop your favourite blend of ground coffee in its container, fix together and pump until the pressure starts pushing the water through the coffee – et voila, a creamy, luxurious espresso. Whittard prove that they’re not just about tea with the AeroPress. Much like the Wacaco, it uses manual pressure to infuse the coffee flavour into the water. It’s easy to use, doesn’t take up any countertop space and people rave about the coffee that it produces. Whether you’re planning a coffee tasting trip to Columbia or heading on the fast train to London Victoria, you can experience coffee wherever you are with the AeroPress.